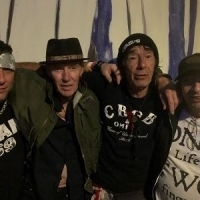 Punk/ Oi band from Surrey, formed in 1976 by Jimmy Pursey. As of 2011, the name "Sham 69" is disputed and there are effectively two versions: the one formed by Jimmy and an offshoot started by guitarist Dave Parsons in 2007. Dave is now part of this version, which features the 1977 line-up of: Jimmy Pursey - vocals, Dave Parsons - guitar, Dave Tregunna - bass and Mark Cain - drums. Their key period from 1978-1981 spawned a few hits including "If The Kids Are United", "Hurry Up Harry" and "Hersham Boys".